Dramanauts: Charging Forward Old School! My Cal 2-29, Dervish, has been getting some major work this month. I've got several projects going on and could almost do a post everyday, if I weren't so darn busy tending to my life. I'm out of my apartment in a week, trying to line up some temporary work to fill the proverbial "cruising kitty," and even managing to find time for dating. I won't be going into that today though. Instead, I'll limit this post to recent work on my charging systems. Dervish inherited quite a lot of hand-me-down gear from Nomadness and the Microship, for which I am very thankful. One of the more useful things was a TrueCharge Statpower battery charger. (It is now the Xantrex TrueCharge.) At a measly 10 amps, it is a bit on the small side, but since Dervish doesn't have refrigeration, or power hungry instruments, she uses very little power now, and will use even less once I swap out the failing, fluorescent cabin lights for a couple of low power LED dome lights. The TrueCharge unit, though originally thought of as a temporary kluge, has been working sufficiently for a year. Why not stick with it? It is a three phase smart charger with dual leads for my two batteries. It is now mounted at the back of the starboard quarter berth where the old scorched Dytek charger once lived and died. In some ways this isn't the best location because I intend to use that berth for storage, which will make it tough to see the charge status lights, but again, convenience dictated. Better to get it done than put it off again waiting for the perfect solution. Moving it later is always an option. At least it's not simply clipped on as it had been for the past eleven months. I've already had one fire as a result of that! (Click here to read that adventure.) 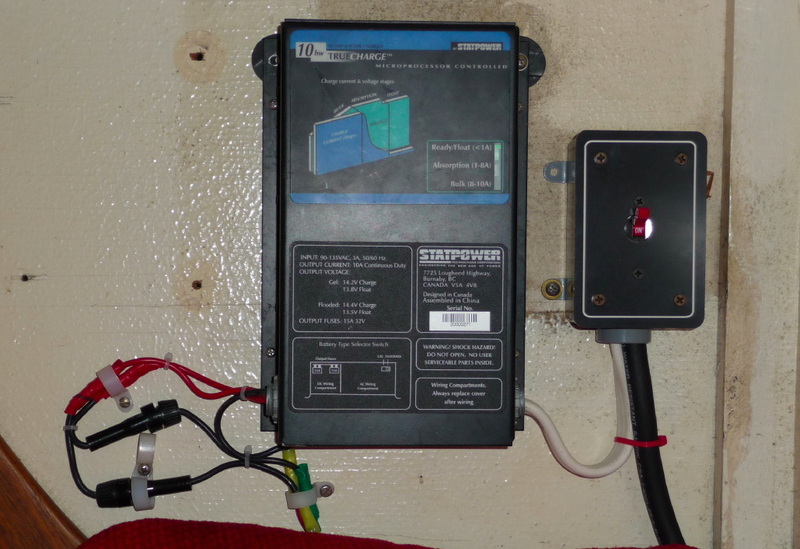 The switch next to it may not be necessary, but it was already wired in to the shore power. I figure if something were to go "haywire," I could manually shut off the charger. Then again, I could probably disconnect shore power more quickly. Next we tackled the bigger issue: the engine charging system. Last summer one of my two batteries had bloated up a bit. We suspected it had over charged, so Steve disconnected the alternator before I put in two new group 27 deep cycle batteries. I didn't want to risk damaging them with over 16v or more surging in. 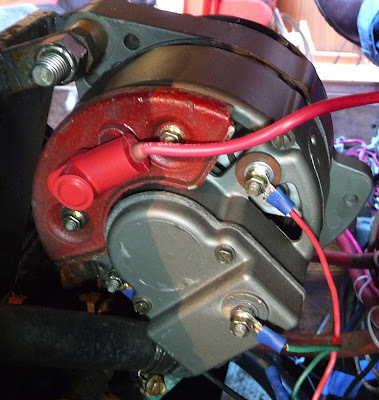 The alternator remained disconnected for all of my outings last summer. It wasn't too much of a problem really, as I was rarely on the hook, and miserly with power the few times I did anchor out. Still, I knew it was something that seriously needed attention. For Dervish, I try to only buy new gear if the old stuff can't be fixed, or if it becomes (or could become) a safety hazard. I like to stay old school when possible. In that spirit, we carried the alternator and voltage regulator to the local guru at Dan's Alternator and Starter Service. Dan said he would test the alternator and open it up to see if a rebuild was in order or if it was irreparable. If I needed a new one, I thought I'd get something beefier than 37 amps, something newfangled with an internal voltage regulator. In the shot above Dan is opening up a Delco alternator, not mine, (unfortunately, I didn't get down there with my camera in time) or even the same make, but he reminded me as he opened it that "basically, all these things work the same way." 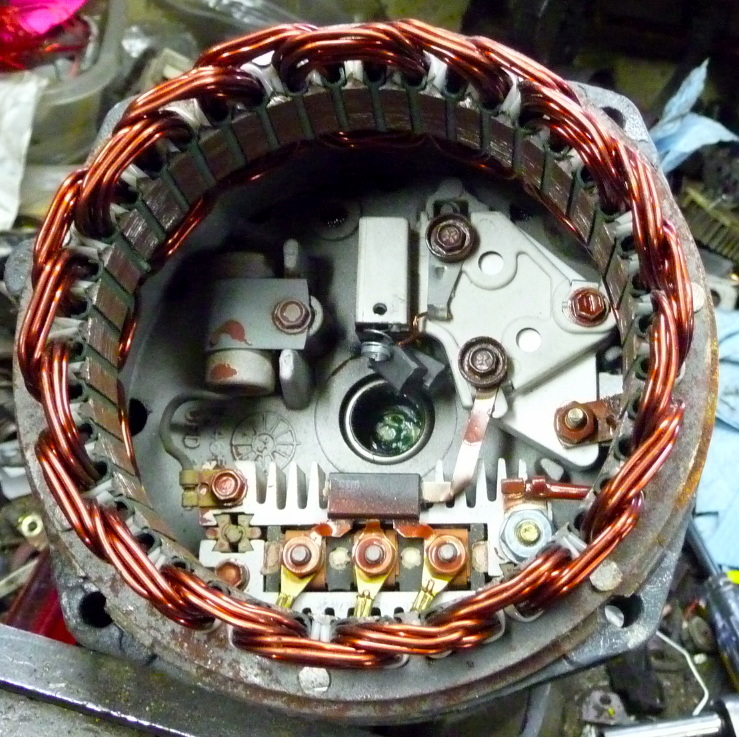 Most alternators look something like this inside. Again, I was delighted to discover that it isn't really all that complicated. It is empowering to demystify some of this stuff. Strange that it took me so many years to discover that I actually enjoy learning how things work. 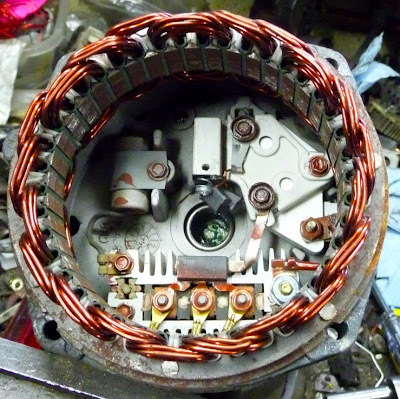 Alternators have stator coils fixed to the housing and rotor coils that are driven by the motor. The rotor produces a field current as the coils rotate. The strength of the field current determines the strength of the magnetic field. The magnetic field has, like all magnets, a north and a south pole. The rotor, driven by a pulley when the engine is running, supplies current to the coils via a set of brushes. As the rotor coils couple with the stator coils it produces A/C, which is passed through a few diodes that rectify it into D/C which can then nourish your batteries. When Dan took my alternator apart, he found the brushes and coils were absolutely fine. 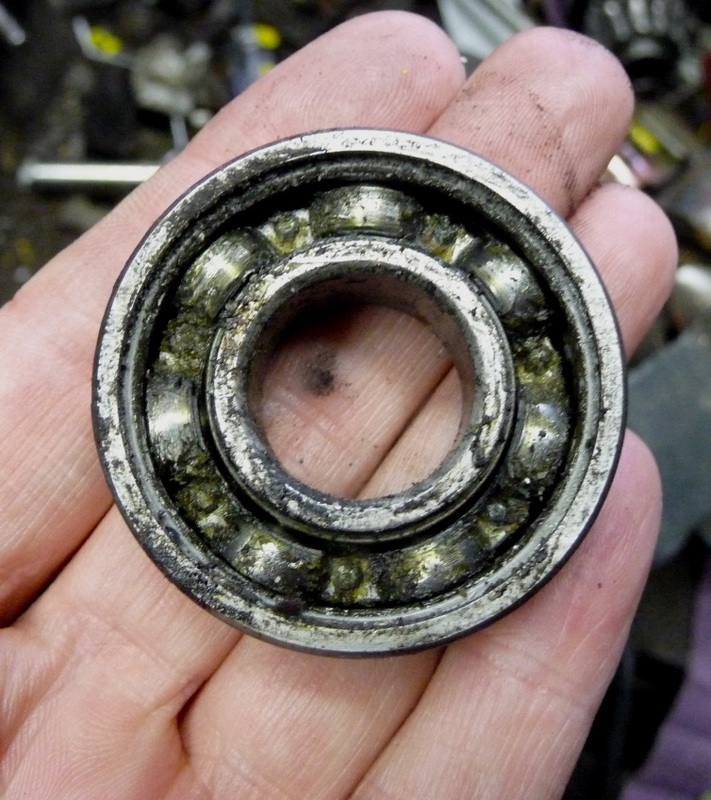 The bearings, however, were toast. Below is a bearing exactly like the one from my Motorola. This one is pretty gunked up, but evidently mine was worse. Fortunately, I hadn't run it until it had frozen up and completely destroyed the whole unit, so Dan was able to replace the bearings without having to do a total rebuild on it. He assured me it was a good little unit worthy of reuse. When we returned a few days later to pick it up along with the new voltage regulator, Shawn and Dan marked the wires and terminals to insure proper installation of the new regulator. You really do not want to hook it up incorrectly, and it isn't all that obvious by looking at it, which wire goes where. Here it is all clean and reinstalled. The new voltage regulator is fastened to the inside of the engine compartment just a few inches to the right. It has been tested and works great! Plus I get "reuse" points, and I saved around $60! 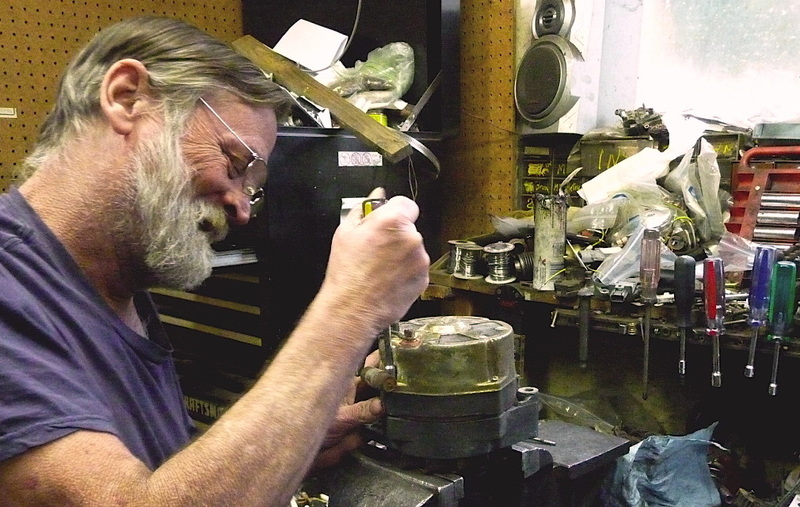 Times are tough and the economy is poor; little shops like Dan's are becoming scarce. 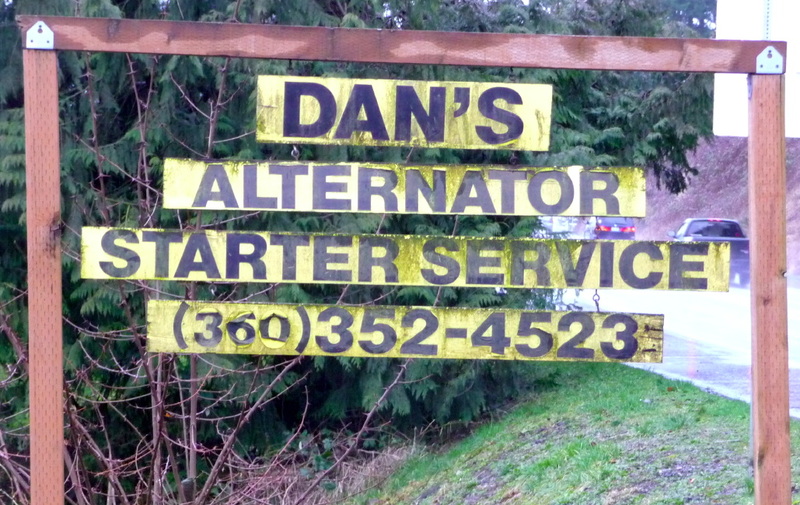 I encourage anybody in the South Sound area to take your business to Dan the alternator man. He'll fix you up. Old school. 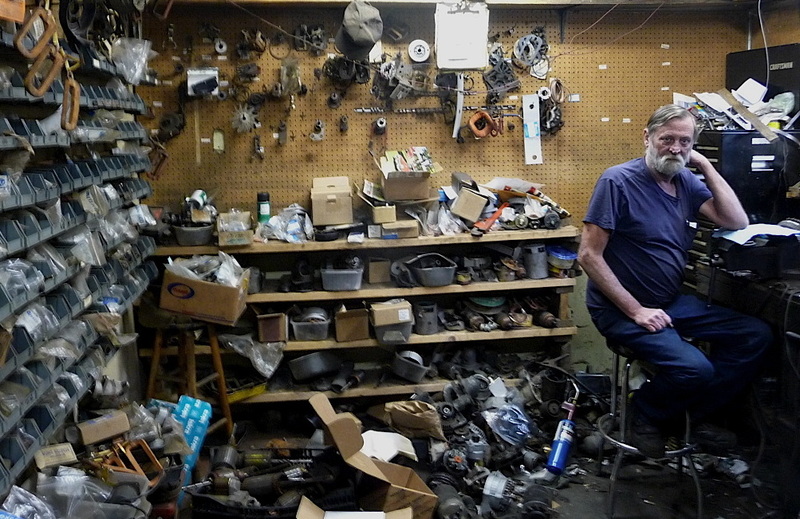 His shop is a metal mess of parts both new and used, but Dan knows exactly where everything is. You can easily miss his sign on Black Lake Blvd, and I told him as much. He said he was thinking of investing in a new one. He knows an aspiring, young artist whom he'd like to hire for her first paid job. If you visit him, be sure to tell him Sky sent you! Great job on having the alternator rebuilt. I had considered replacing it originally, but decided not to for much the same reason you chose to rebuild. Wish there was someone like Dan around these parts! Ya Dan is great-but if you don't know him the pile of beer cans in front of his shop and the super clutter might scare someone! He is great and i have used him for 20 years-he's the best!